The Amityville franchise has more films to it than you might think. Did you know there are 9 Amityville films, including a 2005 remake? The later sequels after the 3rd one are direct to video so they may not be as well known as the original 3. After the part 3 the focus wasn't so much on the house in Amityville but the objects that are in the house and now make their way out to the world. 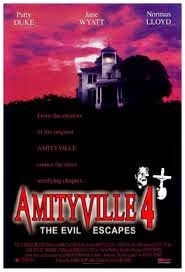 Part 4 is about a possessed Lamp that comes from the haunted house in Amityville. 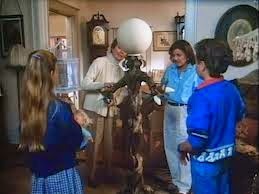 Rummaging through a yard sale, Helen (Peggy McCray), finds a very peculiar and ugly standing lamp. She buys it as a joke and sends it to her sister in California. Her sister, Alice (Jane Wyatt), is about to take in her daughter and 3 children to live with her at the time the lamp arrives. Nancy (Patty Duke) has just lost her husband and she has no choice to move in with her mom and try and get her and her family on their feet. Coinciding with the arrival of the lamp, little does she know what she is in for. I am going to say right off the bat that I love to watch this movie. It is not good by any means but has a pretty decent story and a well rounded cast. Of course everyone remembers Patty Duke from her show when she was younger with her "identical cousin". It's kind of fun to see her in a role like this doing horror. Another notable cast member is Zoe Trilling who went on to star in other horror movies Dr Giggles and Night of the Demons 2. At time this movie is very cheesy and comical but that where the charm lies. I believe it was a made for TV movie. 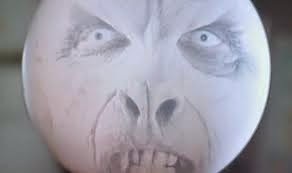 Those type of horror films generally don't do well. Although I have seen quite an increase of the availability of this entry as of late. Some decently priced and some not so much. Most of the Amityville direct to video sequels only have one DVD release and they are all long out of print and hard to find in some cases. I would have to rate this film 6 out of 10 stars. It definitely could have been alot worse, then again could have been a bit better too. For the time period of the late 80's and the subject matter, I think they did a pretty good job to put a different twist on the series.